"Borrowed Halo, sorry this recipe didn't turn out for you. It almost looks as if ... read full review"
Dice celery, carrots, and water chestnuts. Mix all ingredients together in skillet. Pour in cashews and add garlic (you may use as much or as little garlic as you like). Coat with soy sauce, just enough to give flavor; be sure not to add too much, it will be way to salty if you use too much. 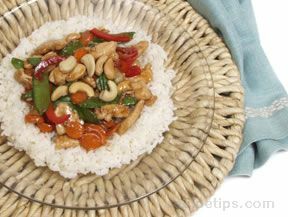 Once cashews are soft this is ready to enjoy over rice. This takes about 20 minutes on medium heat to get done. Tastes great served with Easy Egg Rolls. "Borrowed Halo, sorry this recipe didn't turn out for you. It almost looks as if it is missing some sauce ingredients. 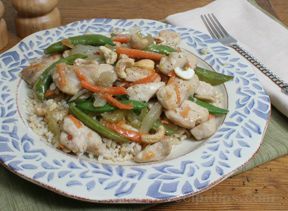 I just wanted to suggest a couple of other cashew chicken recipes on our site that I know are good: http://www.recipetips.com/recipe-cards/t--3821/cashew-chicken.asp or http://www.recipetips.com/recipe-cards/t--1550/chicken-and-cashew-stir-fry.asp are the two I suggest trying. I think you will like them!" "Just made this tonight. My family loved the Wanchai Ferry Dinner Kits, but they are discontinued. 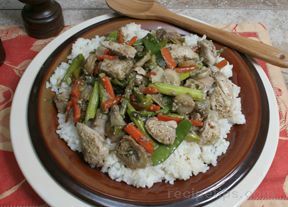 So, we have been looking for a Cashew Chicken recipe. This one was terrible. We usually fight over the left-overs; but tonight even I threw most of my helping away. It tasted like chicken soup. Too much broth. We tried to add soy sauce as a quick fix, but that made it too salty. Looking for a different recipe now."